Huge strides forward in Europe and subsequent market rallies have raised hopes for the region. So is the road to recovery now clear or are significant risks still present? Crucially, what are the key areas of conflict we should be watching closely and which are ‘red herrings’? 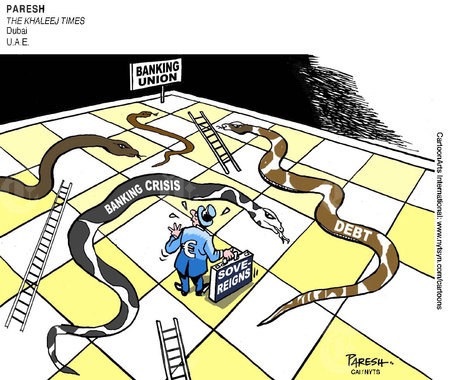 A greater degree of oversight of the banking sector is needed for stability. Issues of experience and breadth of oversight to include smaller banks are somewhat misnomers but issues of authority, conflicts of interest, and deposit guarantees are not. Nevertheless, turmoil creates opportunities and the road will remain rocky for the shorter-term at least. ‘Tail risk’ in Europe has dramatically reduced over the past few months. This refers to the risk of a dramatic event which could drive an extreme change in portfolio values, i.e. a Greek exit from the Euro, having fallen substantially. Prompted by Draghi’s statement that he will do “whatever it takes” to save the euro, and solidified with his launch of an ‘Outright Monetary Transaction’, buying the bonds of countries that request help, markets have moved to reflect this reduction in perceived risk. But does this mean the road to recovery is now clear? Unfortunately not. The risk of an immediate euro breakup may have eased but Europe still needs to integrate further before we can say unity has been strengthened sufficiently. With the region rocked every time there is turmoil in one country’s banking sector, providing a level of oversight to spread, offset and protect from risk is a desperately needed move forwards. Agreement has been reached to progress this course of action, and the European Central Bank put in charge. So what are the key areas of conflict we should be watching closely to decipher how far risk has truly abated? What issues matter and which are ‘red herrings’? The ECB may have been the natural choice of supervisor but it has neither experience of direct supervision, nor dedicated staff. However, this is probably the most easily remedied concern, with recruitment of a team with appropriate experience. Of greater concern is the lack of authority with which the central bank would begin its ‘reign’. A ‘Banking Resolution Mechanism’, i.e. a process for the enforcement of support, rules and regulation, will only come into place at a later date. Threats without force are just words and the sustained support that could bring is doubtful. Furthermore, the central bank’s original mandate of price stability could be compromised. It is unclear how a conflict of interest can be avoided when knowledge of bank positioning may affect its resolve to implement monetary policy. Knowing an interest rate move, for example, could destabilise a large bank and create a level of turmoil, may muddy the waters. Germany has voiced its opposition to a broad-based level of oversight, focused not just on the largest banks but any that could pose a risk to the stability of the banking sector. As the country within the region with the largest number of ‘small’ banks as well as almost a third of the regions total number of banks, this has been a focal point in the press. The claim is that the administration costs to comply would be enormous, passed on customers and hit the local economy. However, for two main reasons this again is more of a distraction than a nail in the coffin. Firstly, as in Spain, for example, it was issues in smaller banks which brought chaos to the country. Bankia, the ‘bailed-out’ bank, was constructed from several smaller struggling banks. Germany’s smaller banks together have total assets than exceed Deutsche Bank and are responsible for around 38% of both bank lending and deposits. Therefore, oversight should indeed include these banks. Secondly, on a day-to-day basis, smaller banks may continue to receive oversight similar to national arrangements, minimising the feared disruption and cost. Rules were ‘softened’ when the European Parliament expressed the desire for the ECB to have the choice of delegating its supervision of smaller relevant lenders to national authorities. A feeling of loss of sovereignty is still tough to challenge but may be eased and outweighed by necessity. Nevertheless, hostility from Germany continues in the form of opposition towards a single deposit guarantee scheme. A ‘run on banks’ was touted as a key risk as capital outflows from the periphery European countries gathered momentum last year. A lack of confidence in the safety of customer deposits drove exits and challenged the liquidity levels and stability of the targeted banks. A region-wide scheme to guarantee these deposits is hoped to bring some calm and reduce these fears. This is a crucial part of the longer-term plan for a return of confidence to the region but has seemingly ‘dropped off the agenda’ according to Germany, resisting further discussion. The fear is the relative strength of one country will be used to offset weaknesses in another. Tax payers from one country could end up having to pay for the mistakes of a bank in another. Nevertheless, behind the headlines, it is understood that some form of transfer from Germany to the periphery is necessary for stability and this is certainly an issue to watch closely going forward. Therefore, Europe has some crucial challenges to tackle over the next few months. Longer-term strategies must be embedded to protect the region. To complicate matters, politicians will continue to be distracted by ‘putting out fires’. For example, a request for help by Spain remains hotly debated and there is the potential for further civil unrest in reaction to growing opposition to austerity. The risk of further turmoil in Greece is high as it is tasked with completing bank recapitalisation and paying public sector debts, but a long-term solution to alleviate reliance on financial support remains illusive. Turmoil creates opportunities and the road will remain rocky for the shorter-term at least. International firms that are merely headquartered in an area of weakness can provide an interesting opportunity as price moves, volatile in the shorter-term, more accurately reflect underlying value over the longer-term. Bank Scandals: Is This Just The Tip Of The Iceberg? From accusations of interest rate manipulation, to charges of illegally hiding transactions with Iran, the spotlight is well and truly on the banking industry. Institutions appear to have been operating right at the edge of what’s reasonable where the line between right and wrong can become blurred. Crucially, it highlights how issues can occur outside ‘investment banking’, and therefore attempts to classify one part of the industry as bad and one part good is flawed. Nevertheless, public opinion is against the banks and it’s up to them to earn back respect. We’re entering a tough new paradigm of tighter regulation, greater demands for transparency and less incentive to lend. Vindication, conviction and takeovers are all possible but one thing we can be more certain of, the regulator is watching closely and further turmoil is likely. Standard Chartered has been accused of illegally hiding transactions with Iran. The aggressive attack of money laundering charges came as a shock to investors, who punished the bank’s shares with a sell-off of more than 16%, wiping $6bn from its market value. So what can we take away from this latest scandal? Is this a one-off or an indication of an industry wide shortfall? The complication seems to arise from the claim that the bank was already working openly with US agencies and 99.9% of this business complied with legislation. However therein lies the shortfall, the opaqueness. Investors maintain these discussions should have been better highlighted in their last annual results. The confusion surrounding whether they did or did not do wrong may signal that they could have been operating right at the edge of what’s reasonable. With a focus on profits and market share, the line between right and wrong can become blurred. Indeed previous fines have merely moved not mitigated risk. As other banks closed their doors on these types of transactions, Standard Chartered, it has been argued, may have instead welcomed the new business. Changing this culture may prove prudent. An interesting aspect of this investigation is the type of bank business it is targeting. This is not an investment banking scandal. Instead commercial banking dealings are under attack. Could this have been avoided by having investment banking and retail banking separated? Arguably no. It is not as binary as one part good, one part bad and not all banks overall are the same as each other either. Indeed, investment banking can help subsidise the cost for running other banking operations and although transgressions may have been made, not all who work in the industry can be tarred with the same brush. There is huge political capital in ‘bank bashing’, finding a common ‘enemy’ to engender sympathy and support. But the pressure is on the banks to earn back trust. Likewise, whilst banks have to get used to tougher regulation, we must accept that fines could erode their reserves and reduce their incentive to lend. A tougher ‘new paradigm’. Furthermore, whilst financial institutions must accept greater demand for transparency, both banks and regulators must improve the way they communicate with the public to avoid unnecessary panic. It appears that ‘diamonds aren’t forever’ as Bob Diamond steps down from his role as the CEO of Barclays Bank, amid investigations into interest rate manipulation. Instead, disruptions to the banking industry will be widespread and with far reaching consequences. Damage to confidence could reign in credit availability even further, lead to job losses and even affect our standing within Europe. Could I Have Been Affected? With between 200 and 250 thousand mortgages linked to the benchmark interest rate (Libor), many may have been affected by rate manipulations. However, it is unclear whether they would have lost out or benefited from the activity. Barclays traders have been accused of both pushing up the rate, as well as pushing it down. Depending on the environment, on some days it would have been better to borrow at cheaper rates, and on others to earn more when lending. Barclays is not alone. The investigation into interest rate manipulation has already touched 18financial institutions, with 12 having fired or suspended employees. Furthermore, in addition to scrutiny from the regulators, many banks face private lawsuits as well. RBS is a prime example. After having terminated or suspended at least 4 employees, the bank is facing a wrongful dismissal lawsuit from one of them claiming they were used as a ‘scapegoat’. The banking industry is the largest private sector employer, providing over 1 million people with jobs. Already struggling with low trading volumes, low merger & acquisition activity, weak economic growth and tighter regulation costs, Credit Suisse is rumoured to be planning to cut a third of their senior roles in Europe. As Barclays agrees to pay a $451m settlement as a result of these investigations, we see a glimpse of the additional burden banks will have to bear and the further cost and job cutting that may result. In this environment, banks will not be encouraged to lend. Lending: More than £100bn of lending has already been withdrawn from the economy in the last 4 years, regardless of the Bank of England pumping over £300bn into the economy. Small firms are being asked to pay higher rates to borrow and keeping in mind they create the majority of new jobs, again the outlook for employment is worrying. As Chancellor Osborne asserted “What we don’t need is (the banking industry’s) reputation tarnished” instead “we need Barclays to be focused on lending”. Support for a Banking Union? As an example of insufficient oversight, these investigations could heat up the debate between those wishing to maintain a level of independence and authority over our banks against those in favour of our participation a Banking Union. This would involve a single regulator to oversee banks across Europe and answer calls for greater control over the banks. However, with the situation in Europe deteriorating, as unemployment continues to rise and debt burdens remain a challenge, there has been opposition towards greater integration. The spotlight is well and truly back on the banks. Investigations must be handled carefully otherwise it could be the ‘man on the street’ that will feel the consequences.